Then Again, What Do I Know? 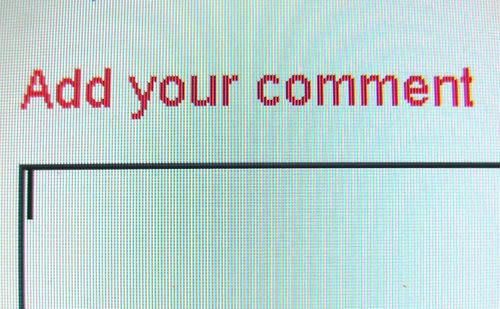 : Comments – I Love Comments! Comments – I Love Comments! One of the great things about Social Media is that it facilitates real conversations among users. Those using Social Media can glide back and forth from being content consumers to being content providers with ease. One of my hopes in writing this blog is that I can help facilitate conversations about how services for individuals with one or more developmental disabilities are funded and delivered in our state and the nation. That is why I encourage all of my readers to comment on my posts. You can even do it anonymously if you like. Comments make this blog a more complete forum for everyone interested in serving some of our most vulnerable citizens, and the more conversation, the better. The commenter was exactly correct, and I realized that by trying to over-simplify a point, I ended up missing a key point. Excellent point, especially considering how often I talk about the need for us all to work together as a team. Along those same lines, I once did a post on how providing services for individuals with one or more developmental disabilities was an essential part of the economic health of communities. By far the majority of comments on my blog are positive and in support of what I am saying, or congratulating an individual we serve or employee at Imagine! I have highlighted in my “Good News Friday” posts. I am very appreciative of those positive comments. But – that doesn’t mean I don’t welcome disagreeing opinions. Since I have been doing my blog, over 135 comments have been made, and currently the blog averages close to 3,000 page views per month. Those are not huge numbers, but they do demonstrate the potential of this blog to be a true community forum where anyone who is willing to participate can be part of a bigger conversation about the future of services in Colorado and beyond. We are at a critical point right now in our field, and significant changes are afoot. Not all of those changes are being made with input from the people who will feel these changes the most. I encourage you to make your voice heard!